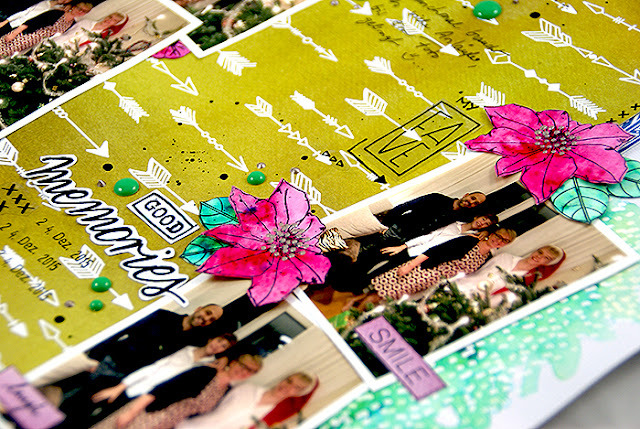 Hello there everyone, it´s Sanna here today with my very first scrapbook layout project share. I am very thrilled to be joining this great team and being able to create with the beautiful Studio Forty products. I started with a stamped and heat embossed resist technique using the Patterns 4 clear stamp set and white embossing powder. Next I added a layer of water with a water tank brush and carefully poured some green Brusho onto the wet areas. This way the watercolor ink pigments only react with the wet area and the dry ones will stay clean. 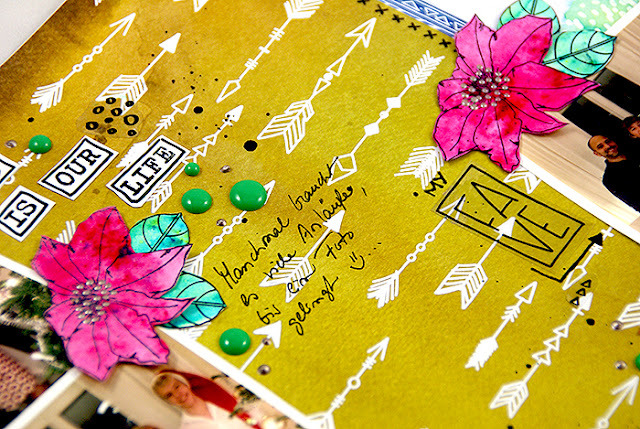 Due to the heat embossed areas, the stamped image will resist the Brusho colour and add interest to the background. I then chose to use the Moonchild - 02 paper with the arrows to guide the viewers eye towards the photos. 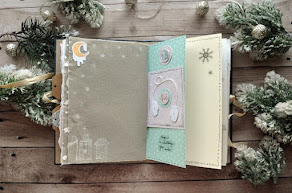 I outlined the arrow paper with strips of the Moonchild - 01 blue toned paper and then arranged the photos onto the page. It might seem, that all the photos are the same, but if you look carefully, you will see that there are 5 different group photos on the layout. that is also the story behind this layout - it is not always easy to create the "perfect" family photo, when everyone is pulling faces or looking somewhere else than towards the camera. Sometimes it takes more takes than one. Thus the multiple photos. 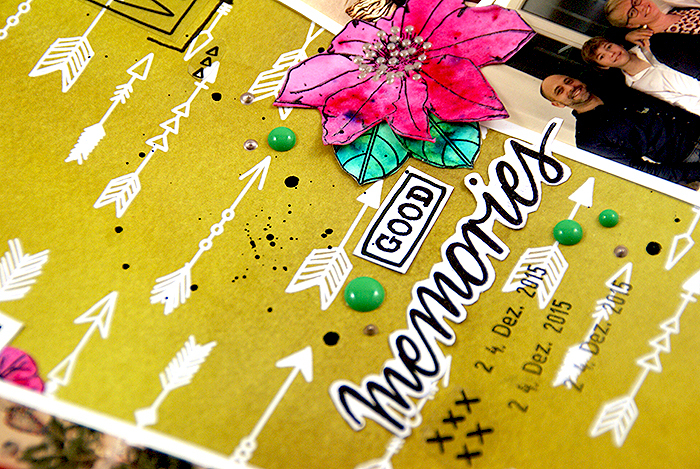 The transparent sticker from the Colors of Memories set points towards the photo we chose as the best one. 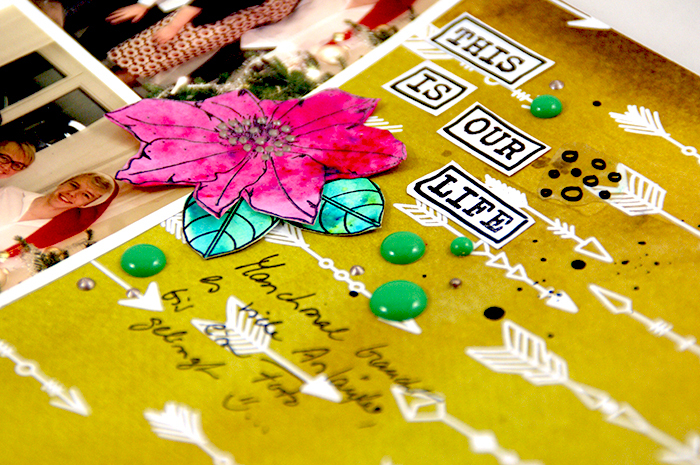 To add some fun details to the layout, I colored white paper scrap pieces with Brusho colours, stamped flowers and leaves from the Flowers 1 set with black ink and fussy cut them all with small scissors. The flowers remind me of poinsettias, so they go nicely with the Christmas themed photos. The title and parts of the journaling are also stamped on white paper with black ink, using the Happy Memories stamp set. I´ve outlined some of the words with a black pen to make them stand out from the background. For decoration I used green enamel dots, some Nuvo Crystal Drops in antique rose tone, a date stamp and black Glimmer Glaze ink splatters. In the end I also added a few stickers words next to some of the photos, just to add a fun detail here and there. This is a gorgeous layout !